Razor is a well known U.S/ brand, an icon of American culture that has become a synonym of fun and the spirit of freedom. Razor dirt bikes have quickly become a phenomenon as every Razor dirt bike provides an excellent riding experience and cutting-edge technology, while still being priced affordably for everyone to enjoy. Kids love riding dirt bikes. 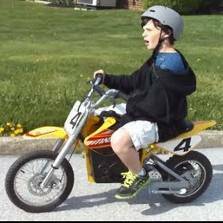 Once you buy a Razor dirt bike, don’t be too surprised when your youngster suddenly puts their iPads, Game Consoles and other electronic gadgets aside to actually go spend some quality time outdoors! After all, if something motivates kids to put down video games, it must be something really impressive, right? That’s why once you buy a Razor motorcycle, you can be confident that this is going to be the best gift your child ever received! First, however, you will need to choose the right model for your child and this is where we aim to help you. Before we start, one note though. This article is for dirt bikes. If you’re looking for Razor pocket bike reviews, you might want to read this post. 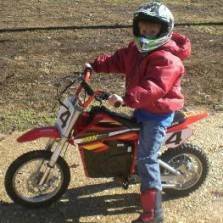 Dimensions 44"x 24.5"x 31" 56"x 24.5"x 36" 56"x 24.5"x 36" 56"x 24.5"x 36"
Razor dirt bikes are safe, miniature versions of regular dirt bikes for adults. 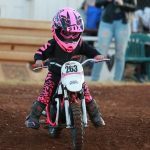 To pick up the right model for your child, you need to take into account his/her age, height and weight as well as the kid’s riding experience. The smallest model is the Razor MX350 which is 44 x 24.5 x 31 inch. 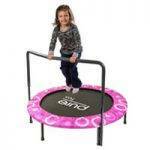 The largest one is the Razor MX650 which is 56″ long, 24.5″ wide, and 36″ high. Two other models fall in the middle with the Razor MX400 being slightly smaller than the increasingly popular Razor MX500. Many of our readers have looked at pictures of some of the Razor dirt bikes, and gathered that the models are larger than they really are. 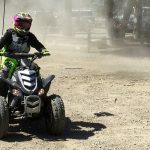 To help correct any mistaken impressions, we are posting a few on-site pictures that should better illustrate the real size of various Razor dirt bike models. Razor MX350 if your kids are between 5 and 8 years old. 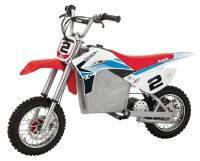 This Razor dirt bike will be perfect for kids that have never ridden before. 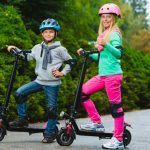 If your child already knows how to ride a bicycle without training wheels then she/he can jump onto MX350 and ride safely. Razor MX400 for ages between 6 to 9. However, it’s worth to note that MX400 should also fit well a taller 6-year-old rider. If your youngster has mastered bicycle riding before and demonstrates talent in riding, you can skip MX350 and opt for MX400 even if he’s 5 or 6 years old. Razor MX500 if your kids are between 8 and 14 years old. If your kid has ridden before, MX500 will deliver more torque than the two previously mentioned models. This Razor dirt bike features a more powerful 500-Watt electric engine which will make young riders smile with joy. 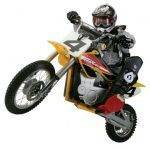 Razor MX650 for kids that are over 10 years old. Although we’ve seen some 8-year-olds riding MX650, we generally recommend this razor dirt bike to more grown up kids as the bike features a powerful 650-Watt engine with speeds of up to 17 miles per hour. 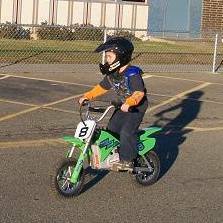 When deciding on the Razor motorcycle keep in mind that your children will outgrow their kids dirt bikes in the next couple of years. Therefore, you may want to buy a slightly larger bike (e.g. MX500 instead of MX350) so it can be used for a longer period of time. Almost Zero Noise. Electric dirt bikes are amazingly quiet. Go for a Razor electric bike if you want to keep your neighbours happy! Acceleration & Handling. Electric engines give dirt bikes instant torque and acceleration available at any RPM. Because there is no gearbox, riding an electric dirt bike is easy and intuitive. Fuel Consumption. Not only electric bikes accelerate quicker but they are also significantly cheaper to ride. At less than one cent per each mile travelled, Razor electric dirt bikes enjoy an enormous fuel cost advantage over gas-powered bikes. Safety. Electric dirt bikes allow extra safety. Watch this video explaining why is it safer for kids to ride electric bikes. No emissions. 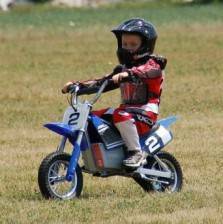 Because electric dirt bike doesn’t burn gasoline, your kids won’t be inhaling exhaust fumes. With no gas tank and exhaust, a Razor dirt bike is a squeaky clean, zero-emission bike. Price. Although there’s no big gap in pricing between electric and gas dirt bikes, the former tend to be cheaper. You may struggle with finding a gas dirt bike that – for the same price – matches electric dirt bike in terms of quality and performance. Install the front wheel. It’s easy to setup and takes a minute. Tires are inflated when shipped but it may happen that they lose some pressure if the bike has been stored for a longer time. If this happens, use a bicycle-style tire pump (Schrader-type valve) to inflate the tires. Attach the handlebards. Use the 5mm hexagonal key wrench (included) to attach the handlebards to the bike’s frame and tighten bolts securey so the handlebar doesn’t move forward or back. Attach the Front Fender as well as the Number Plate (one screw). This takes less than a minute. Charge of the battery. It is very important that you activate your new battery with an initial charge of around 12 hours before first use. Once it’s fully charged, it’s ready to use! 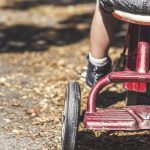 At KidsRideWild, we live and breathe kids’ ride-on toys! We have reviewed every Razor motorcycle available for sale and published a detailed, authentic review on each model. In addition, we recommend reading through Amazon reviews as there are many quality, first-hand customer reviews available there. Thnks for the blog. STill confuse between SX500 vs mx500 for my 8 yrs kids targeting him to use for next 5-6 yrs. any suggestion? ANY suggestion which store normally have more discount amazon vs ? Excellent info…far more than any on the web provided….thanks much I gotta buy a few of these and did not know how 2 size…2 thumbs up!! !